To open the Text Editor dialog box in Title Edit Mode, select Title from the Format Selection drop-down menu in the Text Editor toolbar. For more information, see Toolbar. By switching the Text Editor dialog box from Text Edit Mode to Title Edit Mode, you can quickly convert text objects into title objects. Converting text objects to title objects will strip the text of all inline formatting, including bulleted and numbered lists, special characters, and hyperlinks. 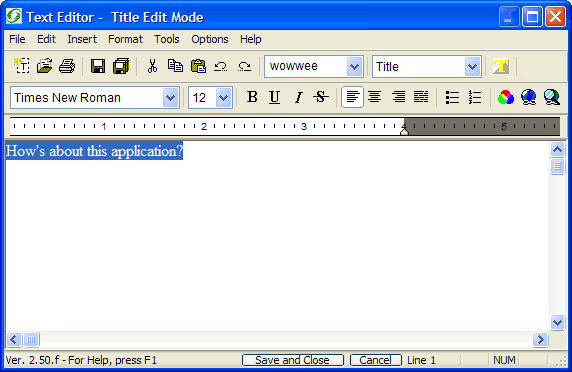 The Text Editor in Title Edit Mode features a menu bar and toolbar that offer many of the same options as in Text Edit Mode. For full descriptions of the options available in the menus and the toolbar, see Text Editor Dialog Box (Text Edit Mode).